While I await this year’s minuscule (i.e. I could buy myself and a friend fancy coffee drinks, maybe) tax refund, let’s start our discussion of the Knits That Breathe Project Particulars with the Pacific Coast Tunic. This design not only made the cover of the book, but was the first one I designed for it. I confess to being kind of a geek for garment construction techniques that look rather complicated, but are actually quite straightforward in execution. The Pacific Coast Tunic is a perfect example of this. It’s made of four pieces, but not in the way you might expect. Short-Row shaping at the hem of the side panels serves two functions; while the curving hem gracefully covers what some wearers might consider a surplus of generous hip, it also provides soft drape and movement with every sway of those hips. The smocking detail at the top of each center panel is both a stylish detail (and one that calls for some really special buttons!) and a subtle technique to accentuate the A-line shape of the tunic – another way for those important vertical seams to provide flattering lines where we need them the most. 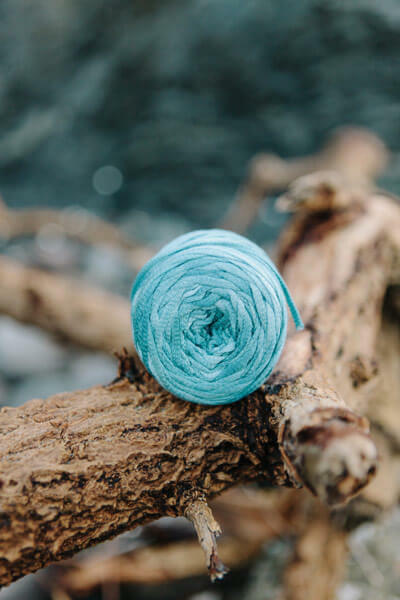 The yarn used in this project is the wonderful Tencel Tape by Prism Yarn. 100% Tencel (a lovely fiber with origins in wood pulp, but definitely no splinters here! ), it glides smoothly through the fingers and is a pleasure to work with. Easy to care for, it’s got plenty of shape-holding body AND a soft hand, and absorbs dye well for beautiful color saturation and retention. I can’t recommend it highly enough! I adore this tunic, and can’t wait to wear it this summer (although after last night’s snowfall and this morning’s temperature of 32 degrees, I’m seriously wondering if summer will ever come to Chicago this year!). I’ll also wear it with a tissue-weight white tee shirt underneath. 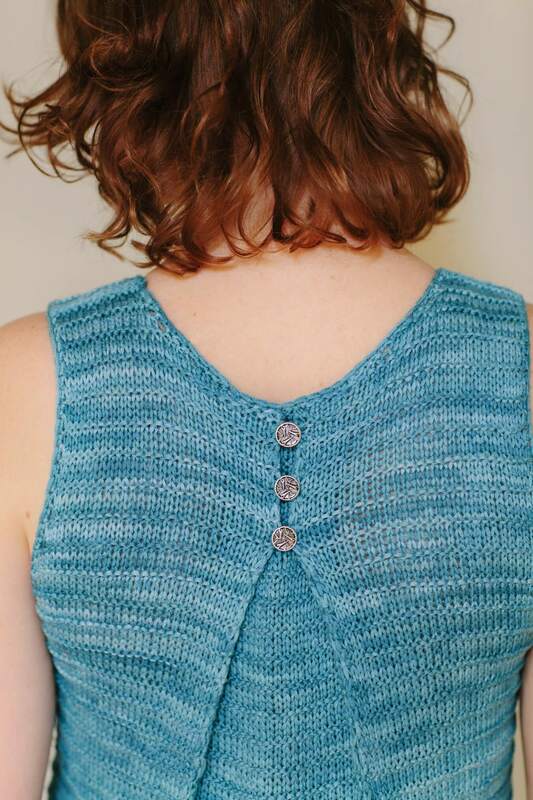 When I wore it that way to Chicago’s YarnCon, I couldn’t take ten steps without being stopped by someone asking where she could find the pattern. The good news is, the pattern is in Knits That Breathe, and the book is available for purchase now. 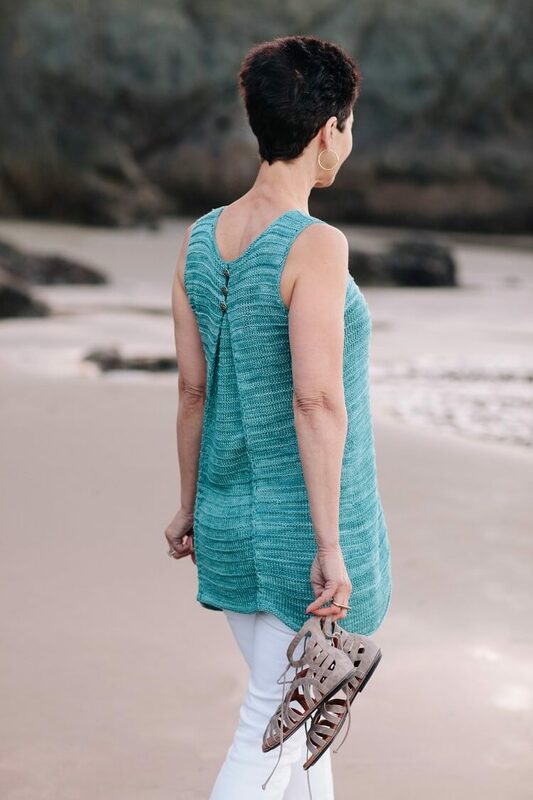 Make one of your own and soon you, too, will be getting stopped everywhere you go by knitters wanting to make their own Pacific Coast Tunic.